Alaska is one of the few places with a legal sea otter fur trade. The species is listed as endangered in some areas, but in Southeast Alaska they’re booming. As part of CoastAlaska’s “Alaska Made” series, here’s a closer look at the tight restrictions on who can work with the prized pelts and how. Sea otter is the densest fur in the world, with upwards of one million hairs per square inch — downy hairs that can take to the air when cut. Will Ware of Petersburg is sewing, hunched over a sewing machine in his living room. 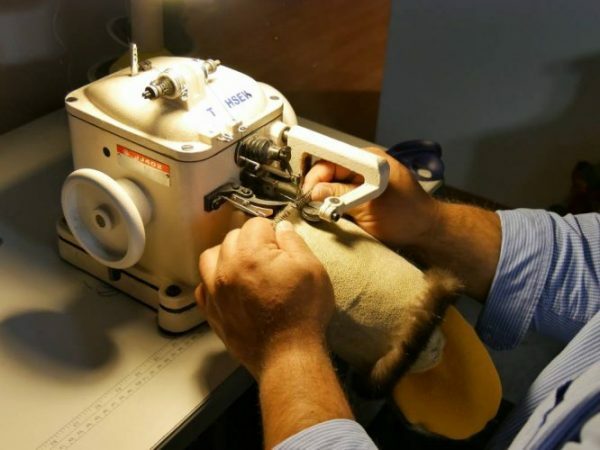 His sleeves are rolled up, and he’s meticulously sewing a pair of seal skin mittens. They have three inches of sea otter fur at the top. Ware’s been hunting sea otters for about eight years, often with his sons. The fur is tanned in the nearby village Kake. He tries to use every inch: The pelts can run up to $200 each. There’s no harvest limit for Alaska Natives. Ware bags about 30 to 40 sea otters per year to make a variety of items, like hats, mittens, scarves and teddy bears. It’s not a huge moneymaker; he’s got a full-time job. But he also owns a gallery in Petersburg and sells his work online. About 90 percent of the world’s sea otters live in Alaska. They were nearly wiped out in the early 20th century by the fur trade. In the 1960s, about 400 animals were brought from the Aleutians to repopulate Southeast. And it worked. Now fishermen often complain there are too many. The sea otters eat up the shellfish — crab and sea urchins — that fishermen catch commercially. Sea otters can weigh 100 pounds and eat a quarter of their body weight in a day. But the modern sea otter trade is slow-going. Across town, there’s a workshop happening to teach people how to sew the hides — by hand. Half a dozen students sit around a table covered in brown sea otter pelts. Marcus Gho is the instructor brought to town by the Sealaska Heritage Institute in Juneau. He helps a student smear a thin layer of glue over a seam. Federal regulations prevent mass production of sea otters. One must be at least one-fourth Alaska Native to possess tanned, unmodified skins. Sea otter products can’t be produced by people working together. It has to been done by individual craftsmen. Classes like these are the exception. But jumping through regulatory hoops is worth it for Gho. He hunts up to 40 sea otters a year and says it’s not about money. If this class is any indication, Alaska Natives will continue the craft. And there should be plenty of sea otters to provide the materials. The population in Southeast is growing steadily. Several years ago a survey estimated almost 26,000 animals. Scientists estimate a growth rate that could put the current population over 40,000. But the data is old, and the U.S. Fish and Wildlife Service is gearing up for an updated survey in the next year.